There were at least three additional photographers operating within Auckland in July 1876. Published in the Daily Southern Cross were the American Photographic Company, R.H. Bartlett, Clarke Bros., plus Hemus & Hanna, all vying for the patronage of the public. 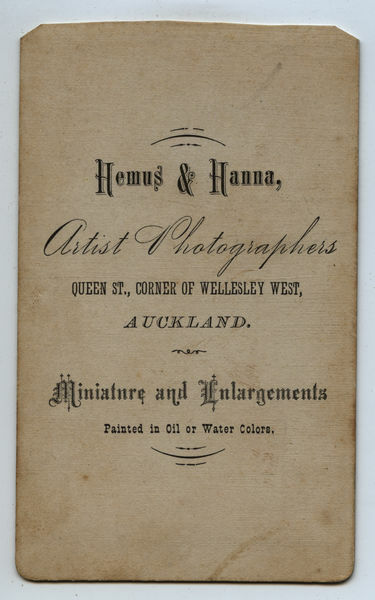 No doubt to distinguish themselves from the other photographers, Hemus & Hanna started offering photographs of New Zealand's unique sites to tourists. Confirmation of this approach can be seen in an advertising campaign carried out in 1878 when the pair offered photographs of the beautiful Lake Rotomahana district for sale through their Queen Street studio. The partnership of Hemus & Hanna was officially dissolved on 14 April 1885. Although Charles Hemus continued the business in his own name, John Robert Hanna would also continue by purchasing the business of Clarke Bros. and opening his own studio. The partnership between Hemus and Hanna lasted just under ten years from August 1875 (officially opening for business in September) through to April 1885.